This week, we’re jet setting to Washington, D.C. for a little Franco-American Pop Quiz. Hip Gees and High Jumpers, this one’s or you. Pour on the laugh soup. What’s my line? Take a gander at the yellow house on the right. Who lived in these historic Georgetown digs during the late 1950s? For bonus points, give us the name of the masterpiece he or she worked on whilst living there. Any Guesses? Give us your awe. Scoop on Les Halles: Winding it back to the late 12th century, go-getter King Philippe Auguste expanded Paris’s central market, gifting it with a new location, rooftop shelter and the world famous name, Les Halles. By the way, this king of the original urban re-do also paved streets, created a sewage system, organized the first Paris police force, and built a defense wall, along with a fortress on the site of the current-day Louvre. How to top that? Vous voulez garder la téte? Time travel, blow us away. First, the smells, detectable from blocks away. Sharp cheeses, rotting vegetables from the days before, animal manures, stale beer spilled by the vendors. Then imagine the cacophony. The noise of delivery wagons rumbling over cobblestones. The shouts of drivers reining in their carthorses. The squeals of live pigs and bleats of sheep. Above it all, the hawkers (a.k.a. the “criers” of Paris) would have lured you in with their loud rhythmic songs touting their goods. And what a range of choices to be had! Brandy and coffee vendors selling their beverages by the cup were at the top of the market’s pecking order while the fishmongers didn’t rank as high—even though they had the best track record, consistently moving their finny products from the coast to the city in just a few days. “Come on ladies, come on ladies, one pound fish, one pound fish?” Like today’s London-based “fishmonger” Muhammad Shahid Nazir’s “One Pound Fish” rap tune gone viral, one might say! Clipping Nazir, very, very good. Unfortunately, not everyone felt the big love for Les Halles or the myriad colonies of huge, well-fed rats who had long taken advantage of all that free room and board in the old market. 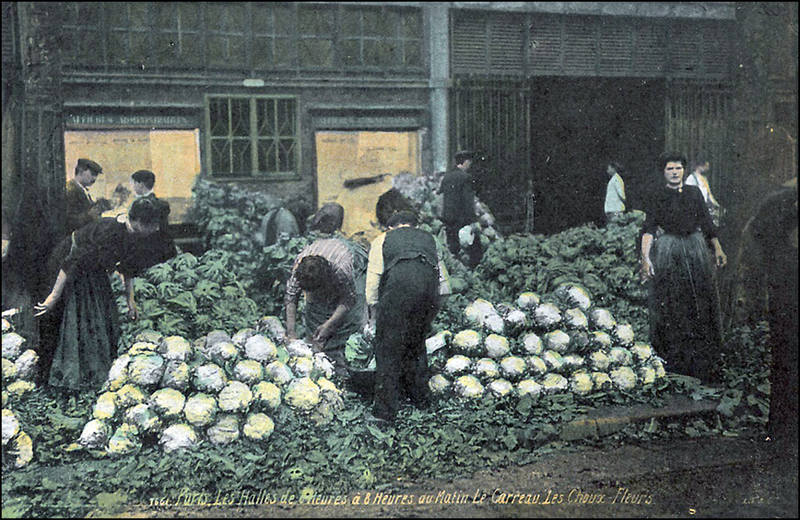 And so during the 1970s, all the vendors were relocated to Rungis (now the world’s largest wholesale fresh food market) outside of central Paris, and the venerable old structures were demolished and replaced with an underground mall complex that now faces its own doom. For every season turn, turn, turn—indeed. Today, throughout Paris, there are currently about 70 roving open-air markets (“marchés volants”) and 15 covered markets. Heads-up: They don’t call them “marchés volants” for nothing. The “flying markets” appear only once or twice each week on their assigned market days, sell their goods, and then roll up their canvas roofs and move on to another neighborhood. Tip: No market close to your hotel or flat? Don’t fret. Most arrondissements have bustling “rues commerçantes” (shopping districts) which have many of the same advantages, if not the same Old World atmosphere. Abbesses is a favorite. 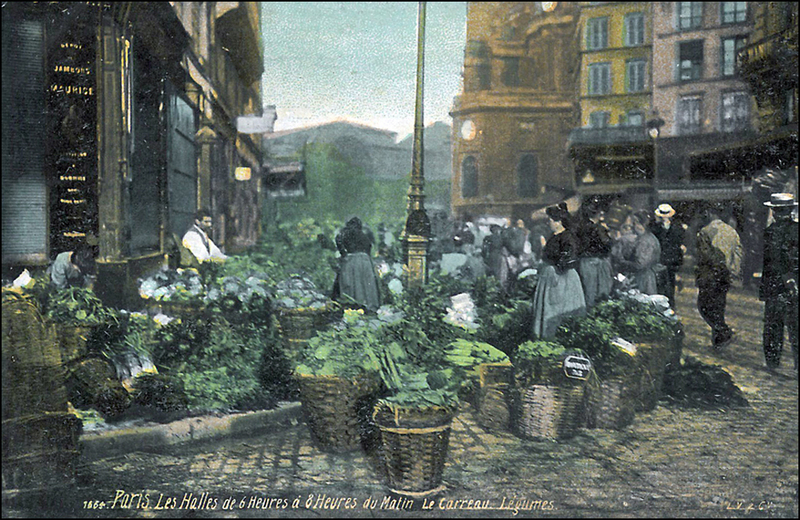 Now, thanks to the miracle of old post cards, we’re able to dial back the clock and tour Les Halles and Le Marché aux Fleurs à la Madeleine. Roll the tape! Dig Pop Quizzes? Check out Paul’s Paris by Cellphone site. Don’t miss his “Where is it Wednesday” contests. Very entertaining. Thank you, Theadora. Blessings for a wonderfully peaceful and joy-filled Christmastime. Ah, thanks Lizzie Joy!! Here’s another one of my favorite Julia Child quotes: “Find something you’re passionate about and keep tremendously interested in it.” Happy Holidays! T.
Oh yum…wish I was there. YES. There’s so much to see! Window shopping (Faire du lèche-vitrine — “window licking”) is always great fun in Paris. The vendors and shopkeepers create works of art! T.
You feed my mind…have a wonderful holiday season. I alway look forward to your posts. Great photos and commentary. That first photo is so good it should be in a magazine. Gosh, thanks!! Seafood is always photogenic—in my book. Catches my eye each and every time! T.
Thanks, Deano! A few years ago, I competed in a marathon in La Rochelle. Prizes for completing the course? Chocolate, a long-stem rose, a handsome jacket, a VERY large box of oysters! It was a perfect day. T.
Your mystery guest would be Julia Child. V. Ring-a-Bling-ding!! Congratulations Virginia, Krista and the Tin Man. The Dream Team solved the mystery once again. YES. Julia Child is our mystery guest. In 1961, Julia, along with collaborators Simone Beck and Louisette Bertholle launched their cookbook: “Mastering the Art of French Cooking.” It took them about a decade to get it published. But they did. Dear dear Miss T. It was J. Child who introduced me to French cooking. I still have that cookbook – food stained, a little tattered, and filled with memories of wonderful food. V.
I boarded my time machine – loaded with empty shopping baskets, and set it for the year 18ll – les Halles. I shopped until my baskets were overflowing with treasures of the market. Then returned to the now laden with the ingredients to create a banquet worthy of Babette’s Feast. Isak Dinesen had whispered the ingredients in my pearl shaped ear. Wonderful pics of past Theadora. V.
It’s high time to find the book and the film! Perfect timing. T.
Dear Miss T. A good thought. We plan on revisiting Babette this holiday season. I love the Veuve Clicquot on the list. We have much to thank Madame Clicquot for. Your mystery guest is Julia Child and she wrote about eating and shopping experiences in her delightful memoir, “My Life in France.” A must-read for people of love food, Paris, and/or Julia. Happy holidays! Another RING-A-DING-BlING. Bravo, Krista!! I also highly recommend reading Julia Child’s “My Life in France” (2008) book. Nora Ephron’s “Julie & Julia” 2009 film was based on it. Meryl Streep and Stanley Tucci were fabulous! Krista, have you read Bob Spitz’s “Dearie: The Remarkable Life of Julia Child” book? Released in August of 2012, it’s also an interesting read. More great photographs! No idea who that would be, Babs! But…I certainly know I love your sumptuous images (had I not just finished dinner, they would make me very, very hungry!)! And the postcards are superb and so fun! Well, thank you!! I also love the postcards. Especially the top shot of the sous chef. I’m now obsessed with the Les Halles “6 AM to 8 AM” series. I love the shallow depth of focus, so that the background begins to look a lot like an Impressionist painting. . .
No, you haven’t missed it…because there has been no snow, Mlle B.! A huge storm was ‘predicted’ for last night–hyped to the heavens–and NOTHING! Poor man has been selling very wet trees from all our rain! Joyeuex Noel a vous, et Bonne Annee 2013! Drat it all!!!!!!!!!!!!!!!! I worked late and others beat me to the quiz!!!!! OOOOOOOOOOOOOO the Tin Man always wants to be the first with the correct response! Julia Child who, of course, wrote : Mastering the Art of French Cooking published in 1961 by Alfred A. Knopf after being rejected by Houghton Mifflin. “The only real stumbling block is fear of failure. In cooking you’ve got to have a what-th-hell attitude.”………..the lovely Julia. Who, by the way, I imitate when I am Chef Emil in my kitchen at the market………..of course customers love it. Mon Theadora le plus cher, en vous souhaitant la meilleure de la saison de jour férié, le peut être rempli de merveilleux plats de nourriture et de flûte après la flûte de champagne! OH, NO. You are not late. You are on time, as always. Cha-Ching! Thanks for completing our little riddle, Tin Man!! Yes, Julia’s “Mastering the Art of French Cooking” published in 1961 by Alfred A. Knopf after being rejected by Houghton Mifflin. I loved your Julia quote: “In cooking you’ve got to have a what-the-hell attitude.” Fabulous. Fabulous! Monsieur Tin Man, I bet you do have a fantastic “Julia Child” imitation up your chef’s sleeve. Funny! Do you have a favorite “Bouillabaisse” recipe? Perhaps Virginia also has one. . .
Over the holiday season, I’m looking forward to enjoying some of the items focused in these great photos. French food shopping does indeed have a way of changing how one looks at/enjoys food and les relations humaines. Joyeuses Fetes! YES. I also love the hand-painted holiday murals on the shop windows and doors. All across Paris restaurants, pâtisseries, boutiques, and even pharmacies get the spirit going by hiring artists. They really contribute a little something more to the color and dazzle of this season of transformation. Sigh! T.
It is indeed magical here, especially at this time of year! You have my Awe, and thank you TB for the feast! The markets might have moved on but I have happy memories of some great bars in Les Halles . . .
Julia also loved the bars at Les Halles. After a night of “clubbing” in Montmartre, she’d trek to Les Halles for onion soup and red wine. OH, no. Now I’ve got a strong hankering for onion soup and red wine! 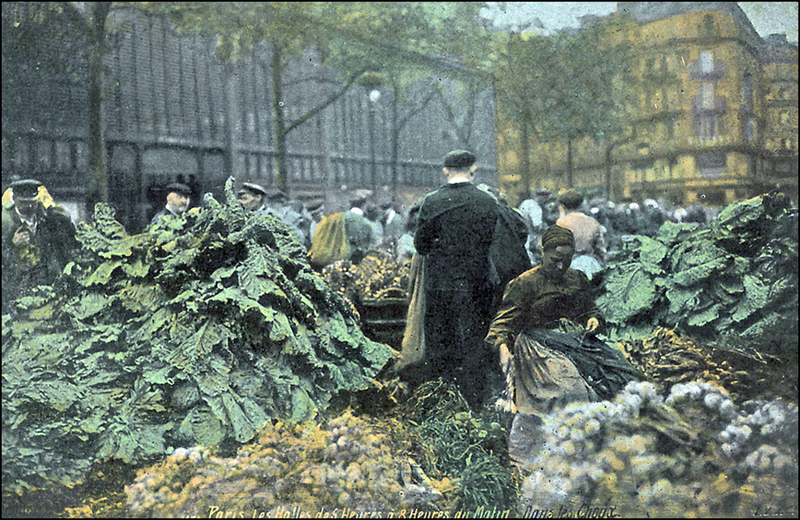 The barrel-chested market workers—unloading crates of fresh watercress from trucks, stacking freshly cut flowers, and preparing for the day. It was cold and dark, but the vast marketplace was beautiful under splotches of yellow electric light. As dawn lightened the edges of the sky, we found ourselves at Au Pied de Cochon for a traditional bowl of onion soup, glasses of red wine, and cups of coffee. At five-fifteen, we straggled home. Thank you, Tammy!! I thoroughly enjoy working on the post. Enjoy the weekend! T.
well it was discovered already at J.C. but nice piece and great photos as usual. And yes now Rungis is bigger than all, and the Halles is prettier ::) and even better once renovations are done. YES. J.C. lived on Olive Street in historic Georgetown. Bravo!! Have you visited Rungis? And what do you think of Les Halles complex? It’s a hustling, bustling mall and Métro stop. I always get a little turned around in the place. Pay attention to the number system! T.
Love this post about the food market. Enoyd the old and the new. As always, thank you for the swell words! It’s fun to mesh the old with the new. It’s how I experience the world, on most days! T.
Fab post, T! 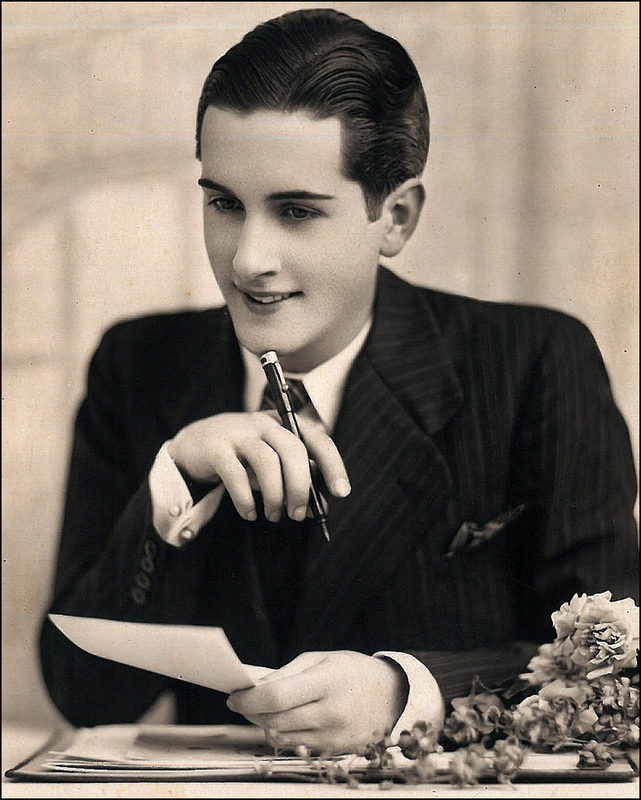 Love your photographs, and the old postcards are fascinating. N has just given me the lowdown on Julia Child – I’d never heard of her. great commentary ! your photos were really wonderful too ! Have a Happy Holiday season ! I love those vintage colorized photos. Beautiful find. Ahhhh, finally made it here and loved my travel to the markets via the TB time travel machine. The postcards are wonderful! On Cleveland’s east side we’re blessed to have an almost year-round market that goes indoors when it gets cold and is outdoors the rest of the time. I’ll miss that when I move! We also have a young woman who does wonderful French pastries and confections: http://www.coquettepatisserie.com/. I hope you had a glorious Christmas with lots of family and friends. And in advance, best wishes for a blessed 2013! Great post – I hope you had a wonderful Christmas with family and friends. The photos of the seafood are terrific. Keep up the great work documenting one of my favorite cities in the world in 2013 (it’s a crime I’ve only been there once!). I just have to live vicariously through you for now. MERCI, Malou. A truck or the new Autolib’ !! T.